Boardpaq, LLC, a Missouri limited liability company formerly known as Candlestiq, LLC ("Boardpaq," "us," "we," or "our"), operates a service (the "Service") accessible through a password-protected portion of a website application available on the BOARDPAQ.COM website (the "Web App"), through the BOARDPAQ iOS application (the "iOS App") available in the Apple App store and/or through the BOARDPAQ Windows application (the "Windows App") available in the Microsoft store. Among other things, the Service allows an organization and its board members to organize, access and otherwise use information and materials related to board meetings. These Boardpaq Terms of Service (collectively, "Terms of Service" or "Agreement") set forth the terms and conditions under which you may access and use the Service, whether the Service is accessed via the iOS App, the Windows App or the Web App. Your use of the iOS App or Windows App is licensed under a separate End User License Agreement ("EULA"). These Terms of Service apply to the organization that is, or is becoming, a subscriber to the Service (each a "Company") and any user (each an "Authorized User") of an account (each a "User Account") issued under Company's account (the "Company Account"). The Company and Authorized User are jointly referred to in these Terms of Service as "you" or "your." BY ACCESSING, REGISTERING WITH OR USING THE SERVICE, YOU AGREE TO THESE TERMS OF SERVICE. IF YOU ARE ESTABLISHING A COMPANY ACCOUNT AND/OR ARE AN ADMINISTRATOR OF A COMPANY ACCOUNT, YOU REPRESENT TO BOARDPAQ THAT YOU HAVE AUTHORITY TO BIND COMPANY TO THESE TERMS OF SERVICE, AND YOU AGREE TO THESE TERMS OF SERVICE ON BEHALF OF COMPANY AND ON BEHALF OF YOURSELF. IF YOU DO NOT AGREE TO THESE TERMS OF SERVICE (WITHOUT MODIFICATION), YOU ARE NOT AUTHORIZED TO ACCESS, REGISTER WITH, OR USE THE SERVICE. Boardpaq reserves the right to modify or change these Terms of Service at any time without prior notice to you. If Boardpaq modifies or changes these Terms of Service, it will also revise the "Effective Date" at the top of this page. The most current version of these Terms of Service can be reviewed by clicking on the "Terms of Service" hypertext link located on the Service. Your continued access to and/or use of the Service after Boardpaq posts any revised Terms of Service constitutes your agreement to any such revised Terms of Service. PLEASE NOTE THAT, NOTWITHSTANDING ANYTHING CONTAINED IN THESE TERMS OF SERVICE OR ON THE SERVICE TO THE CONTRARY, THE SERVICE IS PROVIDED WITHOUT ANY WARRANTIES AND SUBJECT TO LIMITATIONS ON BOARDPAQ'S LIABILITY. THESE TERMS ARE CONTAINED IN SECTIONS 11 AND 12 BELOW. 1.1. License to Authorized Users. Conditioned upon and subject to your strict compliance with these Terms of Service, and subject to these Terms of Service (including, without limitation, termination of the license), Boardpaq grants you, for the period of time that each Authorized User is authorized to access and use his or her User Account by Company during such Company's Subscription Period, a personal, non-exclusive, non-transferable, limited license to access and use the features of the Service to organize, access and otherwise use information and materials related to board meetings, in each case (i) on behalf of Company, (ii) to the extent the applicable functionality is made available to you from time-to-time, and (iii) through the provided functionality of the Service, subject to earlier termination as set forth in these Terms of Service. If any User Account is terminated by Boardpaq or Company, or if a person has not been issued a User Account by Boardpaq or Company, such person does not have a license to access and/or use the Service. 1.2. Use of the Service. You agree not to access and/or use the Service for any purpose that is not expressly permitted by these Terms of Service, or is otherwise unlawful. You further agree to comply with all duties and obligations applicable to your access and use of the Service, including without limitation all those applicable to the Internet, e-mail, privacy, copyrights and trademarks, data and the transfer of data from the country in which you reside, and any other applicable laws, statutes, ordinances, regulations, contracts and licenses. 1.3. Information Provided. If you provide any information to us, you agree to provide only true, accurate, current and complete information. If you provide information to us about any third party, including, but not limited to, personally identifiable information, you represent and warrant that you are specifically authorized to provide such information to us so that we may use, process and transfer all personally identifiable information you provide, and you assume all responsibility for dissemination and use of the information provided. 1.4. Restrictions. You agree not to (a) use any of Boardpaq's trademarks as metatags on other web sites; (b) use the Service in any manner that is illegal or impairs the operation of the Service or its availability or usage by others; (c) display any part of the Service in frames (or any content via in-line links), provided, however, that if you opt to display certain portions of your Company Content publicly in accordance with Section 5.2, you may display that Company Content in frames or via in-line links; (d) make the Service available to any person other than an Authorized User; and/or (e) modify or otherwise create derivative works or improvements of or on the Service. You further agree not to decompile, reverse engineer or disassemble any software or other products or processes accessible through the Service, and not to insert any code or product or manipulate the Service in any way that affects the user's experience including, without limitation, taking any action that imposes, or may impose, an unreasonable or disproportionately large load on the Service. You further agree not to use, upload, input or otherwise provide through the Service any software or other technology, including any virus, worm, malware or other malicious computer code, the purpose or effect of which is to (i) permit unauthorized access to, or to destroy, disrupt, disable, or otherwise harm or impede any computer, software, firmware, hardware, system or network, or any application or function of any of the foregoing or the security, integrity, confidentiality or use of any data processed thereby, or (ii) prevent any person from accessing or using the Service who has been authorized by us to do so (including without limitation any data mining, web crawlers, robots, cancelbots, spiders, Trojan horses, or any data gathering or extraction method in connection with your use of the Service except for customary search engines used in accordance with automated instructions directed to search engines and available on the Service). 2.1. General. Portions of the Service available to different Authorized Users may vary. No Authorized User has access to all portions of the Service. Each Authorized User agrees not to use or access, or attempt to use or access, any portion of the Service for which he or she is not intentionally given access to by us and/or Company, as applicable. 2.2. User Accounts. Company will be issued a Company Account that consists of one or more User Accounts that may be used to administer the applicable Company Account and to establish other User Accounts, subject to any limitations imposed by Boardpaq on the number of User Accounts permitted for each Company Account. Company will retain sole control over the operation, maintenance, management of, and access to and use of, the Service by its Authorized Users. 2.3. Access to User Account. An Authorized User may not authorize any other person to access and/or use his or her User Account. Accordingly, each Authorized User agrees to protect his or her your username and password by, among other things, keeping such username and password confidential. If, notwithstanding the foregoing obligation, an Authorized User allows another person to use his or her username and/or password to access his or her User Account, you will be responsible for all use by that person using your User Account. You agree to (a) immediately notify Boardpaq of any unauthorized use of any Authorized User's password or any other breach of security, and (b) ensure that each Authorized User exits from his or her User Account at the end of each session. 2.4. Security. We will use commercially reasonable efforts to comply with applicable United States Federal and state data security, data breach and privacy laws and regulations. We obtain audits of our information security controls on an annual basis. We will make resulting audit reports available to Company upon request, together with certain financial documents and proof of insurance as required by Company's regulators, provided in each case that Company agrees to the terms of Boardpaq's non-disclosure agreement. Notwithstanding the foregoing or anything else in this Agreement, information transmitted on the Internet and/or stored on systems attached to the Internet such as ours is not 100% secure. As a result, we do not ensure, warrant or guarantee the security or integrity of such information. We will not be responsible for disclosure of any information due to errors in transmission or the unauthorized acts of third parties. In the event that we learn of a data breach of Company's non-public personally identifiable information, or reasonably suspect any such data breach, we shall promptly notify Company of such data breach or suspected data breach. 3. COMPANY. Any use of a User Account comprising a Company Account shall be considered a use of such Company Account. Each User Account must be designated for use by a named individual, and Company may allow only such named individual to use the User Account designated for him or her. If an Authorized User is no longer authorized by Company to use and access a User Account, Company shall deactivate such User Account. Company will be responsible for all access to, and use of, the Service by an Authorized User (and any person that uses and/or accesses the Service through a User Account comprising your Company Account) and for any damage we incur as a result of any act, error, or omission of any Authorized User (and any person that uses and/or accesses the Service through a User Account comprising your Company Account). Any breach of this Agreement by an Authorized User (and any person that uses and/or accesses the Service through a User Account comprising your Company Account) shall be considered a breach by Company. 4. AUTHORIZED USERS. Each Authorized User hereby acknowledges that Company may have submitted personally identifiable information about him/her to the Service. Each Authorized User further acknowledges that Company has the right to (a) except as provided below in this Section 4, access, view, use and copy any content in his/her User Account ("User Content"); (b) control his/her access to User Content and Company Content (including the length of time that such User Content and/or Company Content remains accessible on the Service); and (c) terminate and/or suspend his/her access to the User Account. The Service permits an Authorized User to keep certain User Content private from Company ("Private Content"). Private Content includes (i) User Content entered into the "My Notes" feature of the Service, (ii) User Content entered into other areas of the Service designated as "private", if any, and (iii) annotations on documents accessed within an Authorized User's User Account. Company waives any right it may have, or may now hereafter obtain, to access, view, use and/or copy any Private Content. 5.1. "Company Content" means content uploaded or submitted for a Company Account by Company and/or the individual(s) designated to administer such Company Account, which content may include, without limitation, logos, trademarks, promotional materials, photographs, and other information, documentation and links (including, without limitation, personally identifiable information regarding Authorized Users). 5.2. Company Content and User Content. You and/or your Authorized Users retain ownership of and responsibility for all Company Content and/or User Content (including, without limitation, personally identifiable information) that you or Authorized Users upload or otherwise submit to the Service. No right, title or interest in any Company Content or User Content is transferred to or vests in Boardpaq; however, you authorize Boardpaq to use and display such Company Content and/or User Content (in whole or part) as necessary to provide the Service. For the sake of clarity, Company Content uploaded or otherwise submitted to the Service will be displayed for Authorized Users of User Accounts issued under the applicable Company Account that Company authorizes to view such Company Content, and may be displayed publicly if Company and/or the individual(s) designated to administer such Company Account opt to display such Company Content publicly using features that may be provided on the Service from time-to-time. You represent and warrant to Boardpaq that you have the right to upload or otherwise submit such Company Content and/or User Content to us and to grant Boardpaq the authorization granted in this section, and that such Company Content and/or User Content does not infringe, misappropriate or otherwise violate a privacy right, intellectual property right, or any other rights of any person. 5.3. No Liability for Company Content or User Content. You are solely responsible for any Company Content and/or User Content that you submit to the Service. We shall not be liable for the use or misuse of any such Company Content and/or User Content, including without limitation any personally identifiable information. You acknowledge that we have no obligation to screen Company Content and/or User Content uploaded to the Service. Boardpaq may refuse, remove or disable any content, including Company Content and/or User Content, that is available via the Service. Without limiting the generality of the foregoing, we may remove any Company Content and/or User Content submitted to the Service that you opt to display publicly and that Boardpaq, in its sole discretion, deems abusive, defamatory, obscene, unlawful or otherwise unacceptable. 5.4. Restrictions on Company Content and User Content. You agree not to post any Company Content and/or User Content to the Service that (a) is unlawful, threatening, abusive, libelous, defamatory, obscene, vulgar, pornographic, profane, false, hateful, indecent or otherwise objectionable to Boardpaq in its sole and absolute discretion, (b) contains false, fraudulent, deceptive or misleading statements, (c) infringes, misappropriates or otherwise violates an intellectual property right of any person, (d) violates the privacy or other rights of any third party, or (e) violates any municipal, state or federal law, rule, regulation or ordinance of any jurisdiction, or attempts to encourage such violation. 6.1. Fees. Company shall pay to Boardpaq any fees due in accordance with the fee schedule posted on the Service, as updated from time-to-time. 6.2. Taxes. All amounts payable under these Terms of Service are exclusive of all sales, use, value-added, withholding, and other taxes and duties. Company will promptly pay, and indemnify Boardpaq against, all taxes and duties assessed in connection with (a) any such amounts, (b) these Terms of Service, and (c) performance hereunder by any authority within or outside of the U.S., except for taxes payable on Boardpaq's net income. 6.3. Other. Boardpaq may charge Company a late fee on the outstanding balance of any amounts overdue hereunder at a rate equal to 1.5% per month (19.56% per annum) or the highest rate permitted by applicable law, whichever is lower. Company will reimburse Boardpaq for all reasonable costs and expenses incurred (including, without limitation, reasonable attorneys’ fees) in collecting any overdue amounts. 6.4. Payments. All amounts payable hereunder must be made in U.S. dollars. Company shall make all payments via credit card, debit card or by other means that we may permit from time-to-time. 6.5. Credit Card Payments. If Company designates a credit card or debit card to make payments, Company hereby agrees that Boardpaq (or its applicable payment processor) is authorized to charge Company's designated card on the applicable due date. If Boardpaq (or its applicable payment processor) does not receive payment from the applicable card issuer or its agents, or if payment made by bank draft or other means is not honored, Company agrees to pay all amounts due immediately upon demand. Company agrees to keep the account number and expiration date of Company's designated card and Company's billing address updated at all times. 6.6. ACH. If Company elects to make payments via the transfer of funds from a bank or credit union account, this will be done electronically via the Automated Clearing House ("ACH"). Company hereby agrees that Boardpaq (or its applicable payment processor) is authorized to make electronic transfers via ACH from its bank account for the amount owed on the applicable due date. Company gives Boardpaq the right to resubmit for collection any ACH debit that is returned for insufficient or uncollected funds. Company acknowledges that it may be charged a service fee for any ACH transactions that result in a returned ACH item, including but not limited to those caused by insufficient funds in its bank account, closure of its bank account, or incorrect bank account information. 7.1. General. Unless we agree otherwise in writing, the term of a Company's subscription to use the Service ("Subscription") shall commence on the date we accept (or accepted) Company's subscription request by notifying Company of such acceptance and shall continue for (a) one (1) month, if Company requested a monthly subscription, (b) three (3) months, if Company requested a quarterly subscription, or (c) one (1) year, if Company requested a yearly subscription (the initial one month, three month or one year period, as applicable, is the "Subscription Period"); subject, however, to renewal and earlier termination as provided herein. Upon the expiration of the Subscription Period and each Renewal Period, if any, the term of the Subscription shall automatically renew for successive periods of one (1) month each (for a monthly subscription), three (3) months each (for a quarterly subscription), or one (1) year each (for a yearly subscription), as applicable, (each such one month, three month, or one year period is a "Renewal Period") unless (a) either party gives the other party notices of its intention not to have the Subscription renew at least one (1) business day before the scheduled expiration of the then-current term, or (b) we agree otherwise in writing. All of your obligations accruing prior to termination or suspension will survive. 7.2. Termination by Company. 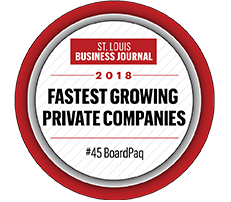 Company may cancel its Subscription by contacting Boardpaq at 314-669-4745 or by sending an email to sales@boardpaq.com. Subject to the further provisions of this Section 7, any such termination by Company shall be effective at the end of the then current Subscription Period or Renewal Period, as applicable. 7.3. Termination or Suspension of Subscription by Us. Boardpaq may, in its sole discretion, terminate or suspend Company's Subscription, at any time, with or without notice and for any reason (or no reason) including, without limitation, for non-payment or delinquency in payment of any fees, or if we believe that Company (or any Authorized User) is infringing, or has infringed, the intellectual property rights of others or is aiding or threatening, or has aided or threatened, such infringement. Any termination by us shall be effective on the date specified in such notice or, if no date is provided, shall be effective immediately. Company agrees that, if its Subscription is terminated, it will not thereafter access, or attempt to access, the Service, directly or indirectly, and if its Subscription is suspended, it will not thereafter access, or attempt to access, the Service, directly or indirectly, until its suspension is removed and Boardpaq gives it express notice thereof. 7.4. Effect of Termination or Suspension of Subscription. Upon termination of Company's Subscription, (a) Company and all of its Authorized Users cease to have access to the Service, and (b) Boardpaq may, in its sole discretion, delete all information and content (including without limitation Company Content and User Content) in the Company Account (including any User Account comprising the Company Account); provided, however, that Boardpaq will, for sixty (60) days following termination of Company's Subscription, use reasonable efforts to provide such information and content to Company at its request. Company may make such request by contacting Boardpaq at 314-669-4745 or by sending an email to sales@boardpaq.com. Notwithstanding the foregoing, (a) Boardpaq reserves the right to retain and use such information and content as necessary to comply with its legal obligations, resolve disputes and enforce the Terms of Service, and (b) neither Company nor any Authorized User will have any right to request or obtain Private Content. 7.5. Termination or Suspension of Access to and Use of the Service. Boardpaq and/or Company may, in their sole discretion, terminate or suspend your access to, and/or use of, the Service, or any portion thereof, at any time, with or without notice and for any reason (or no reason) including, without limitation, if either of them believe that you have failed to comply with your obligations or representations under these Terms of Service, including without limitation by infringing, or having infringed, the intellectual property rights of third parties or are aiding or threatening, or have aided or threatened, such infringement. Any such termination shall be effective on the date specified in such notice or, if no date is provided, shall be effective immediately. You agree that if your authorization to access or use the Service is terminated, you will not thereafter access, or attempt to access, the Service, directly or indirectly, and if your authorization to access the Service is suspended, you will not thereafter access, or attempt to access, the Service, directly or indirectly, until your suspension is removed and Boardpaq gives you express notice thereof. 7.6. Effect of Termination. Upon termination of your authorization to access and/or use the Service, (a) you lose access to the Service, and (b) Company and/or Boardpaq may, in their sole discretion, delete all information and content in your User Account (including without limitation User Content). Notwithstanding the foregoing, Boardpaq reserves the right to retain and use such information and content as necessary to comply with its legal obligations, resolve disputes and enforce the Terms of Service. Boardpaq's termination of your authorization to access and/or use the Service may also bar you from any future use of the Service. 8. LINKING AND THIRD PARTY DEALINGS. 8.1. Links to External Sites. Boardpaq may, on the public areas of the Service (such as the home page located at www.boardpaq.com), provide hyperlinks to other web sites and Internet resources operated by persons other than Boardpaq. Boardpaq has no control over such sites and resources, including without limitation with regard to their functionality, data security or compliance with law. Such hyperlinks are provided for your reference only. The inclusion of hyperlinks to such web sites does not imply any sponsorship, affiliation or endorsement of the material on such web sites or with their operators. 8.2. Linking to the Service. Subject to the further provisions of this Section 8.2, Boardpaq welcomes links to the Service from other web sites. If Boardpaq demands that you not link to the Service, or any portion of the Service, you agree that you will not, directly or indirectly, link to the Service or such portion of the Service as directed in our demand, at any time after such demand is made. 9.1. General. Except for Company Content, User Content and content that is in the public domain, the Service and all content, as well as the selection and arrangement of the content, is owned by (or licensed to) Boardpaq or its suppliers and is protected by copyright, trade dress, trademark, unfair competition, and/or other laws and may not be used, copied or imitated in whole or in part except as expressly provided herein. Except as otherwise expressly provided in these Terms of Service, all rights in and to the Service and content are expressly reserved by Boardpaq. 9.2. Trademarks. BOARDPAQ and the related logos are trademarks of Boardpaq, and may not be copied, imitated or used, in whole or in part, without Boardpaq's prior written permission. In addition, all page headers, custom graphics, button icons, and scripts are service marks, trademarks and/or trade dress of Boardpaq or its licensors and may not be copied, imitated, or used, in whole or in part, without Boardpaq's prior written permission. 9.3. Policy, Notices and Procedures Regarding Claims of Copyright Infringement. Boardpaq respects the intellectual property rights of others. If you believe that your work has been copied and is accessible on the Service in a way that constitutes copyright infringement, you may notify our agent as provided in this Section 9.3. Pursuant to Title 17, United States Code, Section 512(c)(2), Boardpaq designates Copyright Agent as its agent designated to receive notification of claimed copyright infringement ("Designated Agent"). The address of the Designated Agent is 112 South Main Street, Saint Charles, MO 63301. The telephone number of the Designated Agent is 314-669-4745. The facsimile number of the Designated Agent is 636-634-4745. The email address of the Designated Agent is support@boardpaq.com. 10. INDEMNIFICATION. You hereby agree to indemnify and hold harmless Boardpaq and its affiliates, officers, members, managers, directors, employees, equity holders, information providers, suppliers, licensors and licensees, and their respective successors and assigns (collectively, "Covered Persons") from and against any and all losses, damages, liabilities, deficiencies, judgments, interest, awards, fines, costs or expenses of whatever kind, including, without limitation, amounts paid in settlement and reasonable attorney's fees incurred by any Covered Person in connection with any claim, action, arbitration, litigation, subpoena or investigation of any nature (whether at law or in equity) arising out or caused by (a) your access and/or use of the Service, (b) any claim that any Company Content and/or User Content, as applicable, misappropriates, infringes or otherwise violates any third party's rights, including privacy or intellectual property right of any third party, and/or (c) any breach, or alleged breach, of any of these Terms of Service by you. Company further indemnifies and holds harmless the Covered Persons from and against any and all liability and costs, including, without limitation, reasonable attorney's fees, incurred by any Covered Person in connection with any claim arising out of any claim or allegation made or brought by a then-current or former Authorized User, including, without limitation, a claim or allegation relating to, or arising out of, the Authorized User's use of the Service. 11. DISCLAIMER OF WARRANTIES. You expressly acknowledge and agree that your use of the Service is at your sole risk. The Service is provided on an "AS IS", "WITH ALL FAULTS", and "AS AVAILABLE" basis. Boardpaq makes no representations or warranties relating to the Service including, without limitation, representations or warranties that (a) the Service shall meet your requirements, (b) the operation of the Service will be uninterrupted or error free, (c) the Service will be secure; or (d) any defects in the Service will be corrected. TO THE MAXIMUM EXTENT PERMITTED BY APPLICABLE LAW, THE SERVICE IS PROVIDED "AS IS" AND BOARDPAQ HEREBY DISCLAIMS ALL WARRANTIES, WHETHER EXPRESS, IMPLIED, STATUTORY OR OTHER, AND PROVIDER SPECIFICALLY DISCLAIMS ALL IMPLIED WARRANTIES OF MERCHANTABILITY, FITNESS FOR A PARTICULAR PURPOSE (WHETHER OR NOT BOARDPAQ KNOWS, HAS REASON TO KNOW, HAS BEEN ADVISED, OR IS OTHERWISE IN FACT AWARE OF ANY SUCH PURPOSE), TITLE , QUIET ENJOYMENT AND NON-INFRINGEMENT, AND ALL WARRANTIES ARISING FROM COURSE OF DEALING, USAGE OR TRADE PRACTICE. WITHOUT LIMITING THE FOREGOING, BOARDPAQ MAKES NO WARRANTY OF ANY KIND THAT THE SERVICE, OR RESULTS OF THE USE THEREOF, WILL MEET YOUR OR ANY OTHER PERSON'S REQUIREMENTS, OPERATE WITHOUT INTERRUPTION, ACHIEVE ANY INTENDED RESULT, BE COMPATIBLE OR WORK WITH ANY SOFTWARE, SYSTEM, OR BE SECURE, ACCURATE, COMPLETE, FREE OF HARMFUL CODE OR ERROR FREE. 12. LIMITATION OF LIABILITY. IN NO EVENT SHALL ANY COVERED PERSON BE LIABLE FOR ANY (A) PERSONAL INJURY OR PROPERTY DAMAGE, OR (B) INCIDENTAL, INDIRECT, SPECIAL OR CONSEQUENTIAL DAMAGES WHATSOEVER, INCLUDING, WITHOUT LIMITATION, DAMAGES FOR LOSS OF PROFITS, LOSS OF DATA, BUSINESS INTERRUPTION, COSTS OF PROCUREMENT OF SUBSTITUTE PRODUCTS OR SERVICES OR ANY OTHER DAMAGES OR LOSSES, ARISING OUT OF, OR IN ANY WAY CONNECTED WITH, THESE TERMS OF SERVICE AND/OR THE SERVICE, WHETHER FOR BREACH OF CONTRACT, IN TORT OR OTHERWISE, EVEN IF SUCH COVERED PERSON IS ADVISED OF THE POSSIBILITY OF SUCH DAMAGES AND WHETHER OR NOT SUCH DAMAGES ARE A REASONABLY FORESEEABLE CONSEQUENCE OF A BREACH OF THIS AGREEMENT OR A TORT THAT FALLS WITHIN THE SCOPE OF THIS AGREEMENT. In no event shall any Covered Person’s total liability to you for any damages arising out of or in any way connected with these Terms of Service or the Service, whether for breach of contract, in tort or otherwise, exceed the greater of (a) ten dollars ($10) or (b) the amount you paid to us, if any, during the three (3) month period immediately before the applicable claims arose. THE FOREGOING LIMITATIONS APPLY NOTWITHSTANDING THE FAILURE OF ANY AGREED OR OTHER REMEDY OF ITS ESSENTIAL PURPOSE. 13. MODIFICATIONS TO THE SERVICE. Boardpaq may modify the use of all or any portion of the Service at any time for any reason (or for no reason) and without notice or liability. Boardpaq may suspend, discontinue and/or restrict the use of all or any portion of the Service at any time for any reason (or for no reason) without liability upon thirty (30) days' notice by emailing registered administrators of the affected Accounts. 14. GOVERNING LAW AND JURISDICTION. The Service is hosted on servers located in the United States. These Terms of Service, and all matters arising out of or relating to these Terms of Service, shall be governed by the federal laws of the United States and the laws of the State of Missouri, without giving effect to the conflict of law provisions thereof and excluding any application of the United Nations Convention on Contracts for the International Sale of Goods, the application of which is expressly excluded. You consent to exclusive jurisdiction and venue in the federal courts sitting in St. Louis, Missouri, unless no federal subject matter jurisdiction exists, in which case you consent to exclusive jurisdiction and venue in the state courts sitting in St. Charles County, Missouri. You hereby irrevocably waive, to the fullest extent permitted by applicable law, any objection which you may now or hereafter have to the laying of venue of any such proceeding brought in such a court and any claim that any such proceeding brought in such a court has been brought in an inconvenient forum. You agree that any cause of action that you may desire to bring arising out of or related to these Terms of Service must commence within one (1) year after the occurrence of the act or omission giving rise to the cause of action; otherwise, such cause of action shall be permanently barred. You also agree that a breach by you of this Agreement will cause irreparable harm to Boardpaq for which money damages alone would not be an adequate remedy; and that Boardpaq shall be entitled to injunctive and other equitable relief in addition to any other remedies it may have hereunder or at law, without a bond or other security or having to prove that monetary damages alone will not afford an adequate remedy.